There has been a significant backlash against the design concept of skeuomorphism lately. So much that the term has started leaking into the vocabularies of commenters on tech blogs. Users are calling for Jonathan Ive, as the new leader of human interface design at Apple, to put an end to the usage of skeuomorphism in their software. Unfortunately, they’re just jumping on a trendy bandwagon. Right now, the polar opposite of skeuomorphism is in: flat and simple designs with no gradients, texturing or depth. Basically, print design made digital, as John Gruber put it. But that’s trends for you. People go overboard in one direction and then violently swing the other way a year or two later. True, there has been some egregious overuse and misuse of the concept recently. A lot of it by Apple. I really don’t know what got into them with OS X Lion and the newest two versions of iOS. A company known for moderation and elegance in their design suddenly starts churning out gaudy and superfluous visual kitsch like the faux-leather calendar in OS X. There are “good” and “bad” skeuomorphs. A good skeuomorph adds visual cues that a user may already be familiar with in order to give them direction. One example is the desktop metaphor in GUIs. The whole point, in the beginning, was to make it easier for a user to complete tasks tat would otherwise require knowledge of more abstract concepts by using physical metaphors. Instead of updating a file to be a child of a directory, you “move” a file from one “folder” to another. Or drop it into the “trash can” to delete it. I doubt anyone would consider that design choice to have been a mistake. 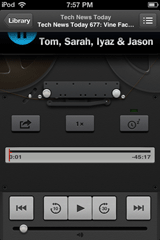 In contrast, a “bad” skeuomorph would be the head-scratching design of the Podcasts app in iOS 6. It looks like an old reel-to-reel tape deck, complete with spinning reels above the shuttle control. I’d hazard a guess that the majority of iPhone users have never operated a reel-to-reel player before, so it doesn’t really add anything to the application other than visual interest. On a related note, I wouldn’t consider the usage of textures to be skeuomorphism, despite what some people seem to believe. Apple’s overuse of that grey linen texture isn’t skeuomorphism, however cliché it’s becoming, since it’s not emulating a real-life object. The Game Center app is, with it’s green felt and everything, since it’s emulating the design of a poker or pool table. I think it’s shortsighted to go running to the opposite end of the spectrum, just because skeuomorphism isn’t always the best tool for the job.